There are certain things that need to be taken care of if you wish to capture high quality audio on Call Graph Skype recorder or any Skype recorder for that matter. Ensuring superior audio quality becomes a must if the audio recording has to be used for transcription or any other business purposes. Before using Call Graph, ensure that you configure it with the right settings. This would help you record your Skype conversations better. There are many ways to configure Call Graph, for instance, you can configure the settings for recording as 'automatically record Skype' so that it acts as a Skype auto recorder and allow you to record Skype calls into MP3 files. You may even choose 'run at startup' to avoid separate startup and make recording easier, among other configuration options. Before you record Skype calls, set the right sampling and bit rate for a better audio quality for MP3 formats. You can choose the sampling rate between 8, 16, 22, 44.1, 48 KHz, and bit rate between 32 and 256 Kbps. There are other options to select the file type and quality as well. You should make your choices based on the purpose of your recording. It is recommended that you use an external microphone for best quality audio captures. You can use the Sennheiser MD-46 (a handheld microphone) which assures great audio quality. An external microphone will also be useful if you have multiple speakers, as you can then shuttle the microphone between them when they are speaking, and reduce the general chatter sound. It is highly recommended that you articulate all the information before starting Skype voice recording. By doing so, you get handy information to record that has been pre-decided, and just need to dictate available content to your Call Graph Skype call recorder. It would also become easier for the transcriptionist or the listener to understand your point of view, since there will be little chances of on-the-spot alterations or change of plans. 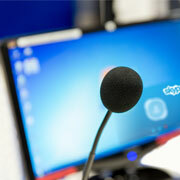 It is instinctive to start Skype recording at your desk, however choosing the right place is important. A quieter place without any disturbances, traffic noise, screaming kids, interventions, office noise, etc., is most recommended. Opt for a soundproof conference room for recording if possible. Always keep spare batteries for your external microphone; and keep a count on the number of hours you have run on your battery. This is really important as most batteries go dead without any indication. So it's important to change them regularly to get the best audio captures. Use proper pronunciation and avoid slangs so that the recording can be used by transcription experts from other regions as well. Also, speak at a steady pace and with the right modulation. Whatever settings we make and whatever tips we follow, we tend to forget something or the other. That is why it is crucial to do a test recording and check it for clarity. Once you do this, you can easily identify if there are any problems and make the necessary changes. Outsource2india offers a wide range of audio transcription services that are known for impeccable quality and accuracy, transcription success, complete confidentiality, faster TAT and great customer service. And surprisingly for our customers, all of this doesn't come at a high price. We hope that the above mentioned Call Graph Skype recorder tips helped you understand how to record Skype calls using Call Graph in the best possible way. Still, if you have any queries on audio transcription or want to more about recording on Skype please contact us to talk to our representatives.